Alex J. Lopez, 53, went to be with our Lord on December 1, 2018. Alex was a radio DJ for KANW. His favorite pasts times were family, cooking, dancing and movies. Above all else Alex enjoyed family. Alex worked at the fiestas and volunteered for a variety of jobs. He was predeceased by his parents: Albert and Carmen Lopez and is survived by his sister, Diane Lopez. Alex’s Life Celebration will begin with a Rosary on Friday, December 7th, at 7:00 p.m. at Salazar Mortuary (3rd & Lead SW). Reception will follow at, Salazar Event Center. 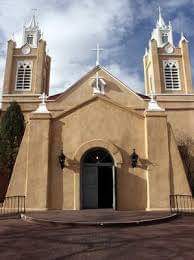 Mass will be 9:00 a.m. on Saturday, December 8th at San Felipe de Neri Catholic Church in Old Town with interment following at Mt. Calvary Cemetery. Reception will immediately follow interment at Barelas Event Center. Pallbearers will be Michael Montoya, Matt Montoya, Paul Hernandez, and Joseph Hernandez. Honorary pallbearers will be Damien Flores and Carlos Perez.